Trying to come up with some clever introduction about Kuwait, I found myself befuddled. Typically in such situations, I ask myself; how did I first come to learn about Kuwait? Unfortunately, I had no clear answer to this question. Perhaps I learned it during middle school when I was forced to memorize a bunch of countries and their capitals. The problem to this seemingly perfect answer was that the capital name seemed to escape me. (This was fixed by a quick Google search, when I embarrassingly discovered that the capital’s name is… wait for it… Kuwait City.) However, I did have some random facts about this small country. For example, I knew of its geographical location between Iraq and Saudi Arabia. I also vaguely knew that the United States engaged in some conflict in the country before I was born and still has presence in the country. A family friend who works for the Air Force recently returned to the United States after serving several months at a military base in the country. However, when it came to choosing books, I was becoming increasingly exhausted with reading books about conflicts. Summer was in its bright glory and I was getting tired of books about death. Thus, I opted to choose a book on a different, but equally interesting, topic. 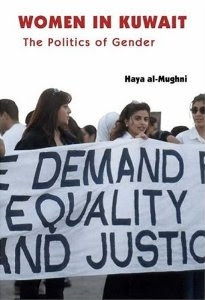 I chose a book entitled “Women in Kuwait: The Politics of Gender” by Haya al-Mughni. As a newcomer to this subject, as well as to gender issues in the Islamic world, I found the book both interesting and accessible. Interestingly, the author immediately ties in gender issues with socio-economic issues at the very beginning of the book: “Access to resources and privileges, which are mediated by kinship and class relations, divide women and set them apart. By virtue of their class membership, upper-class women have much wider opportunities than others.” Thus, the beginning of the book is dedicated to the history of Kuwait and how the socio-economic divides (which persist to this day) first came into being. By the time Kuwait established its independence, it began to benefit greatly from oil revenues, perpetuating class divides, but not creating them. Before the oil industry, there was the pearling industry. This industry forged both divisions and partnerships. The small ruling class and the small merchant class often had similar interests, which were often contrary to the lower classes, including fishers and nomads. In order to maintain wealth and avoid conflict, families often arranged marriages between kin. This increased the differences between class divides and interests. By the time this book was published in 2001, women had not yet received the right to vote, despite much debate and controversy. After looking up more information, women were given and able to exercise this right for the 2006 elections. Kuwait is a small country, and has a small workforce in order to sustain a modern economy. This has been used as reasons for both sides on the rights of women. On page 56, the author states that many Kuwaitis believe that more women are needed in the workplace, instead of offering jobs to foreign workers. Others have noted that when women enter into the workplace and receive good jobs, they must then higher a foreign-born keeper for their children. They argue that the important jobs of rearing the next generation on Kuwaitis should be raised by a Kuwaiti woman, rather than a foreign worker. Thus, women’s place is in the domestic sphere. During Sadam Hussein’s takeover of Kuwait in 1990, many women took up an armed role against the Iraqi invasion. Many were involved in resistance, and two brave women planned a bomb attack, attempting to destroy an Iraqi delegation. This received the attention and praise of many politicians, who offered them more rights. Many of these promises were never kept. The black abbaya, or veil, is still very important to Kuwaiti society. It is important to note that the laws pertaining to women often affect the women in the lower classes the most. Upper class women (from the traditional ruling and merchant classes) are able to travel abroad without adhering to a dress code, have well-paid, respectable jobs, and run the women’s organizations in the country. Lower class women are more likely to be convicted by the laws pertaining to the behavior of women. Is oil the greatest influence in Kuwait?